K-12 students can experience Election 2014 and civics in action through the Kids Voting mock election, a non-partisan education program of Charlotte’s GenerationNation. We LOVE this program that helps kids learn, think and decide. It allows them to read and think critically about government and the issues, get involved in the democratic process, and make their own voices heard. Voting is so important – start ’em young! 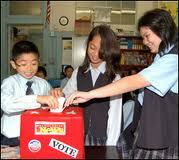 Kids Vote is today, Saturday, and Tuesday at community sites, or at schools through Election Day. In this year’s mock election, students study the candidates and issues and cast their own ballots for US Senate, County Commission At-Large, and other races. They’ll also weigh in on the Mecklenburg County sales tax and City of Charlotte bonds referendums. Results of the student election are counted and announced after voting ends on November 4. Over 35,000 CMS students participated last year. WOW. The program, a partnership of GenerationNation, Mecklenburg County Board of Elections, and Charlotte-Mecklenburg Schools, is the nation’s largest community-based mock election. GenerationNation is Charlotte’s champion for K-12 civic literacy and youth civic leadership. Their smart, fun programs like K-12 civic education, Kids Voting, Youth Civics, and Charlotte-Mecklenburg Youth Council connect classroom education with hands-on experiences to build civic literacy and leadership from an early age. – Click here for voting site. Ask your school’s lead GenerationNation teacher to find out how your school is participating. We Saved the Lazy 5 Ranch!